"You can sit around and stare at the picture tube 'til your brain turns into cottage cheese"
How did you first see "UHF?" I saw it in the theater. No, really! I rented it on video. I have never seen "UHF." What is wrong with me?!? Following such a banner year as 1988, it would have been almost impossible for Al to top that kind of success in 1989. Yet he tried doing just that with one of the most ambitious projects of his career...a feature film. In actuality, UHF was the capper to the tremendous success Al was enjoying after the release of Even Worse in 1988, as production of the film began that July. The script was originally conceived in 1985, if that's any indication how long it took before a movie deal was signed. Could it have just been a coincidence that Al's movie was green-lit soon after he released a hit album? At this point in time, there were very few other places Al could take his career. Sure, now it might not seem to be that big of a deal, as every pop act from Britney Spears to the American Idol contestants can get their own movie. But in the 1980s, film deals were rarely given to anyone but only the most A-list of rock stars (Madonna, Prince, etc.). For a studio to release a theatrical "Weird Al movie" was a big deal. To promote the movie, Al put together a soundtrack album titled (oddly enough) UHF/Original Motion Picture Soundtrack And Other Stuff. The "other stuff" consisted of a number of Al original songs and parodies that weren't connected to the movie. Al was able to write another blues song ("Generic Blues"), parody such late-80s artists as Fine Young Cannibals and Tone Loc, record a polka medley of just Rolling Stones tunes, take on R.E.M. for the first time, and write an original six-minute "road trip" epic called "The Biggest Ball Of Twine In Minnesota." Add this to the actual UHF elements that were featured, such as phony commercials from the movie and the sorta-instrumental "Fun Zone," the UHF soundtrack became the most eclectic and diverse album in Al's catalog. And where there is an Al album, there is also a music video (well, usually). 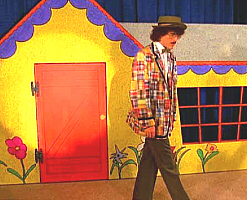 Although a music-video sequence was shot for the movie itself, the first stand-alone music video for the UHF album was for the film's title song, Al's outstanding original "UHF." Keeping with the "collage" feeling of the album, the "UHF" video combined clips from the movie with scenes of Al and the band parodying a variety of rock stars, everyone from the Beatles to ZZ Top. The "UHF" music video would later be hailed as one of Al's best, and it's a production that Al has rarely topped. Unfortunately most fans know by now the story that despite being well-received during audience test screenings, UHF failed miserably at the box office. In addition to almost unanimous bad reviews from critics, the movie faced tough competition from Batman, Indiana Jones and the Last Crusade, Lethal Weapon 2, Ghostbusters II, and numerous other summer blockbusters. After the failure of UHF at the box office, Al left the spotlight for a while to work on his next album and other projects. Needless to say, Al took UHF's poor performance pretty badly. For the next year he would lie in bed re-editing the film over and over again in his mind, trying to find a way that would have made it funnier for the masses. VH1 focused on UHF's failure during Al's episode of Behind the Music, saying that the movie nearly ruined Al's career. Although that may very well have been true, Al was quick to respond to the episode's moodiness by saying "I was disappointed, sure, but I didn't go into some huge spiraling depression." But, to steal a line from Semisonic, every new beginning comes from some other beginning's end. When UHF was released on home video in January 1990, it was quickly discovered by people who may have missed it in theaters. Through VHS rentals, and then later airings on cable TV, viewers finally were able to appreciate UHF as the silly comedy it was. It had finally found an audience...and film buffs think Austin Powers was the first movie to gain attention only after it was released on video! As Al's popularity continued to grow in the 1990s, so would UHF's status as a cult classic. Fans would organize Rocky Horror Picture Show-style dress-up performances of the film at fan conventions, and choice lines would be chanted whenever shown at Al's concerts. UHF was now becoming something bigger and better than it was originally intended. And when the DVD format became mainstream at the turn of the century, UHF often topped the wish lists of fans of both Al and movies in general! Fortunately web sites sprang up, hoping to mobilize that desire to convince those in charge (at this point, MGM) to release the movie on DVD with the attention to remastering and extras that a cult classic deserved. Sure enough, when the UHF DVD was released in June 2002, it immediately became a top-ten hit and was unanimously praised by DVD reviewers. After thirteen years, UHF's underground audience finally turned the movie into a hit. But soon after the movie's release all those years ago, Al would quietly shy away from the public eye and spend the next few years working on a variety of projects. One such project was the 1991 album and video Babalu Music!, a compilation of Desi Arnaz's musical numbers from I Love Lucy. That same year Al also made a brief cameo appearance in The Naked Gun 2 1/2: The Smell of Fear, in which he appeared strikingly different without glasses and a mustache (this is called foreshadowing). The other major project he was working on during this downtime was a brand-new studio album. Most of the originals and a number of the parodies were recorded throughout 1990, but Al was without a lead-off parody that would make a good hit.